SINALTRAINAL's leadership has steadfastly showed the courage and determination to stand up against Coca-Cola, paramilitary threats and death squads. Strong labor unions are critical to improve wages, working conditions and human rights for all workers and for democracies to flourish. For workers in Colombia and Guatemala, a strong union can also mean the difference between life and death. According to "The Coke Machine," by Michael Blanding, published in September 2010, "...the union members do look to the lawsuit and the Killer Coke Campaign as the reason they are still alive." Some find it unbelievable that human rights abuses — systematic intimidation, kidnapping, torture and murder — are occurring at Coca-Cola bottling plants in Colombia. But it's not the first time Coke has committed such atrocities. "For nine years the 450 workers at the Coca-Cola bottling plant in Guatemala City fought a battle for their jobs, their trade union and their lives. Three times they occupied the plant — on the last occasion for 13 months. Three General Secretaries of their union were murdered and five other workers killed. Four more were kidnapped and have disappeared. Against all the odds they survived, thanks to their own extraordinary courage and help from fellow trade unionists in Guatemala and around the world. "A huge international campaign of protests and boycotts was central to their struggle. As a result, the Coca-Cola workers forced concessions from one of the world's largest multinational food giants and kept the Guatemalan trade union movement alive through a dark age of government repression." 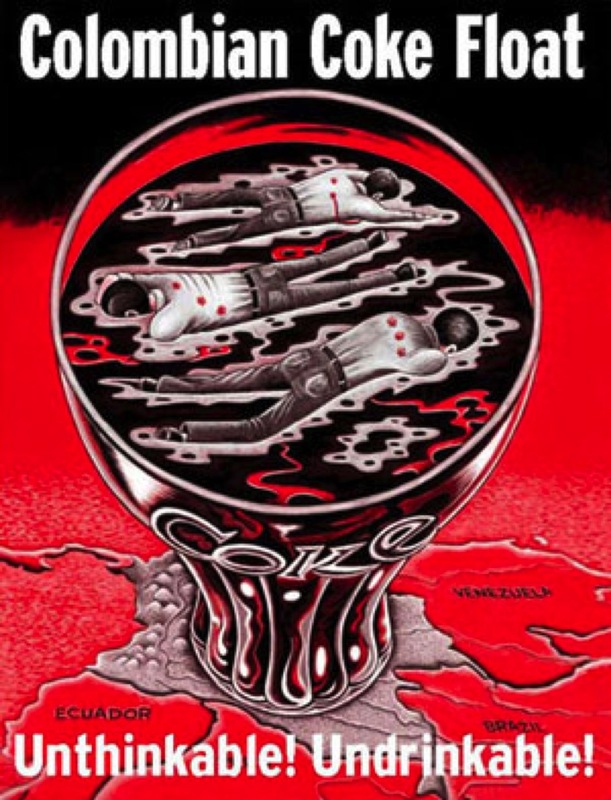 The kind of violence directed against labor leaders at Coca-Cola bottling plant in Guatemala City in the '70s and '80s has been happening at Coke bottling plants in Colombia over the past couple of decades and unfortunately is being repeated again in Guatemala. Listed below are Coca-Cola workers murdered in Colombia. Many more Coke workers and family members have been intimidated, tortured, kidnapped, illegally detained and/or murdered by paramilitaries who have a history of working closely with management. Coca-Cola, which is virulently anti-union, claims that any allegations that its bottlers in Colombia are involved in the systematic intimidation, kidnapping, torture, and murder of union leaders are false. Yet the company has fought every effort to have an independent investigation into these allegations while at the same time has misled the public and its own shareholders with a long string of lies and bogus investigations. Free, democratic labor unions are critical to improve wages and working conditions for all workers and for democracies to flourish. For workers in Colombia, a strong union can also mean the difference between life and death. Moreover, the International Trade Union Confederation (ITUC) reported: "On 26 July 2013, the Coca-Cola bottling plant in Medellin, Colombia dismissed 132 subcontracted workers, 18 of whom were trade unionists. The Sinaltrainal trade union condemned the dismissals, which were designed to ensure that the workers could not negotiate the list of demands and the company could continue to put pressure on their wages." In 2010, the president of Coke Colombia reportedly authorized police to use violence to stop protests at its Medellin plant. Protesting subcontracted workers trying to join the union at the time were fired as were 16 workers who tried to join Sinaltrainal in 2007. 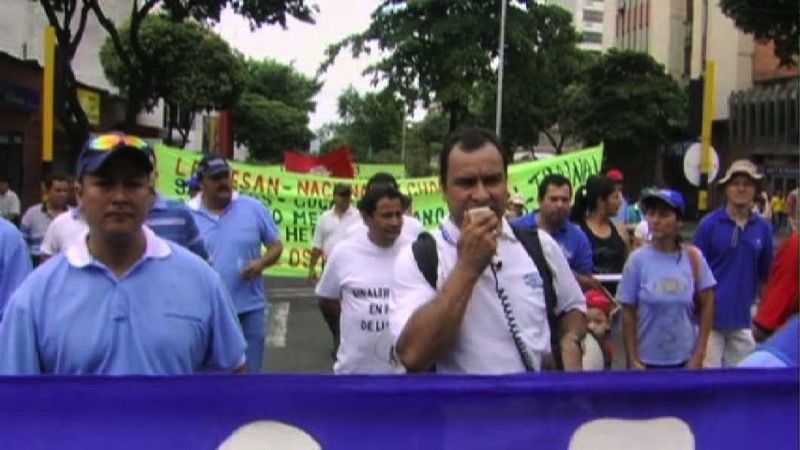 After firing protesting workers in December 2010, the police, according to Sinaltrainal President Correa, remained in the bottling plant 24-hours a day terrorizing workers. Lawsuits were filed against The Coca-Cola Company and its bottlers in Colombia in July 2001 and June 2006 by the International Labor Rights Fund (ILRF) and the United Steelworkers (USW), AFL-CIO. They sued on behalf of SINALTRAINAL, the major union representing Coke workers in Colombia, several of its members and the survivors of two murdered union leaders, Isidro Gil and Adolfo de Jesus Munera. 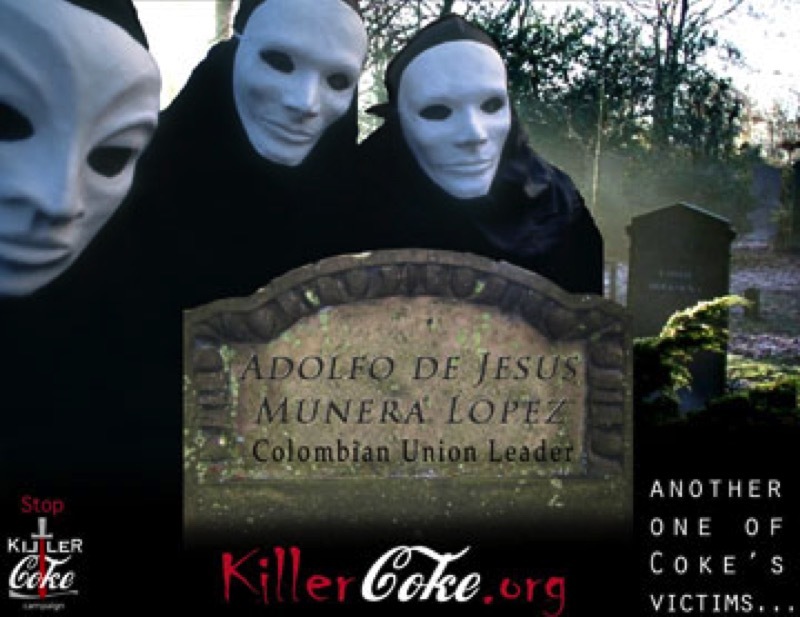 The 2001 lawsuit charged that Coca-Cola bottlers in Colombia "contracted with or otherwise directed paramilitary security forces that utilized extreme violence and murdered, tortured, unlawfully detained or otherwise silenced trade union leaders." Union leader Isidro Gil was killed on Dec. 5, 1996 inside the entrance of the Coke plant in Carepa by paramilitary thugs. Minutes after the thugs showed up, they shot and killed Gil, a member of the union executive board. "One union leader who witnessed Gil's slaying on Dec. 5, 1996, is Luis Adolfo Cardona. Cardona said he was operating a forklift at the bottling plant when he heard the first shot and saw Gil collapse. "Cardona said he was kidnapped hours after Gil's slaying by the same paramilitary unit and narrowly escaped death. The militia torched the local union office and, the next day, told labor organizers to leave the area or die, according to Luis Hernan Manco, then Sinaltrainal's president at the Carepa plant. "Cardona, Manco and a third union official fled Carepa and never returned. Cardona eventually sought asylum in Chicago..."
Two days later, heavily armed paramilitaries returned to the plant, called the workers together and told them if they didn't quit the union by 4 p.m., they, too, would be killed. Resignation forms were prepared in advance by Coca-Cola's plant manager, who had a history of socializing and collaborating with the paramilitaries and had earlier "given (them) an order to carry out the task of destroying the union," the lawsuit says. Fearing for their lives, union members working at the Carepa plant resigned en masse and fled the area. The company broke off contract negotiations and the union was crushed. Experienced workers who made about $380 a month were replaced by new hires at $130 a month. "Testimony was also heard in Barrancabermeja, a site of continuing anti-union violence and a paramilitary stronghold. Luis Eduardo Garcia and Jose Domingo Flores, along with several others, were imprisoned after the chief of Coca-Cola's security accused them of placing a bomb in the plant. The Coca-Cola Company brought criminal charges of terrorism against these employees and three others in 1996 from their Bucaramanga plant. These union activists were detained for over six months until the charges were dismissed as without merit by the prosecution. The workers and their families were never compensated for damages suffered, and some report suffering from post-traumatic stress disorder incurred from their experience in prison. Coca-Cola has failed to condemn these workers imprisonment on the false charges brought against them by their own subsidiary Panamco. "It was brought to the attention of this delegation that there has been continued violence towards Coca-Cola workers since these attacks. As recently as the 11th of September of 2003 Garcia and Flores reported they were victims of subsequent physical attacks. Previously, on the 22nd of August, 2003, an assassination attempt was reportedly made on the life of Juan Carlos Galvis, Vice President of SINALTRAINAL in Barrancabermeja. The delegation also heard first hand testimony in the Atlantic coast city of Barranquilla from Limberto Carranza and his 15-year-old son David Jose, who was kidnapped on September 10th while riding his bicycle. During his captivity, the boy was said to be physically and mentally tortured while he was being questioned on the whereabouts of his father, a union leader in Barranquilla. Witnesses continue to claim that exchanges of money between personnel [of Coca-Cola] and the paramilitary agents are taking place on regular basis." The 2006 lawsuit charges that managers at the Coke bottling plant in Barranquilla, Colombia, conspired with both the Colombian Administrative Department of Security ("DAS") and another gang of paramilitary thugs to intimidate, threaten and ultimately kill SINALTRAINAL trade union leader Adolfo de Jesus Munera on August 31, 2002. The complaint further points out: "The Coke bottler in Barranquilla terminated the employment of Adolfo de Jesus Munera Lopez on the pretense that he was a 'guerilla' wanted by Colombian authorities. In fact, Mr. Munera was fired because of his pro-union activities. ...In 2003, the Constitutional Court of Colombia found that the Coke bottler had terminated Adolfo de Jesus Munera unlawfully and issued a back pay award, to be paid to his family, for the period from 1997 until his murder in 2002." No charges were ever brought against Gil's killers or those who killed seven other workers. Nor has anyone been arrested for the murder of Gil's wife in 2000 or the 2004 murders of SINALTRAINAL union leader Efrain Guerrero's brother-in-law, Gabriel Remolina, and his wife Fanny and one of their children. Efrain was a leader in a hunger strike protesting Coke's plan to close production lines and fire workers. 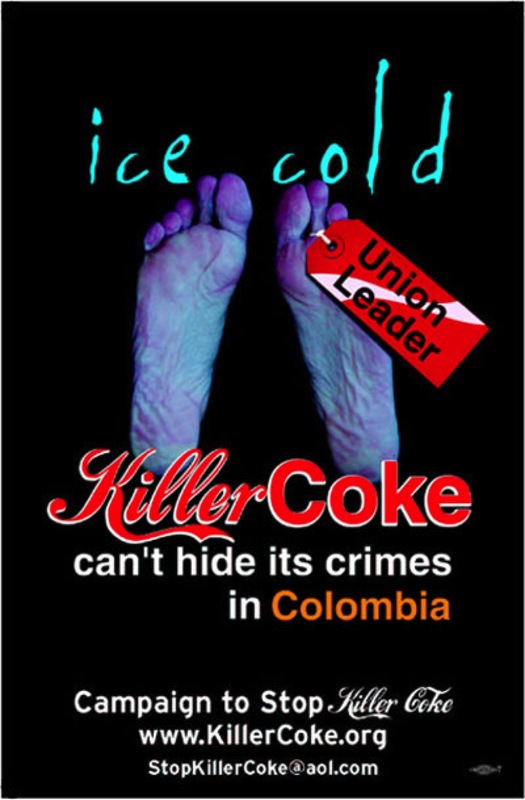 The Campaign to Stop Killer Coke, the lawsuits described in this section and increased security have been major factors in reducing the number of murders and other violence against union leaders and their families. However, SINALTRAINAL union leaders are continuing to receive death threats. Coke boasts that the company and its bottlers have been dismissed from the human rights abuse lawsuits by Federal Judge Jose E. Martinez, but doesn't tell you that his rulings didn't deal with the merits of the cases, but with procedural and jurisdictional questions. Meanwhile, the Campaign to Stop Killer Coke in January 2007, called for the recusal of Judge Martinez because of possible conflicts of interest involving the University of Miami, his old private law firm and the Coca-Cola Company. Judge Martinez: Conflicts of Interest? In October 2006, after lawyers for SINALTRAINAL appealed Judge Jose E. Martinez's dismissal of the 2001 Colombian human rights abuse lawsuits, it was discovered that the judge may have had serious conflicts of interest. 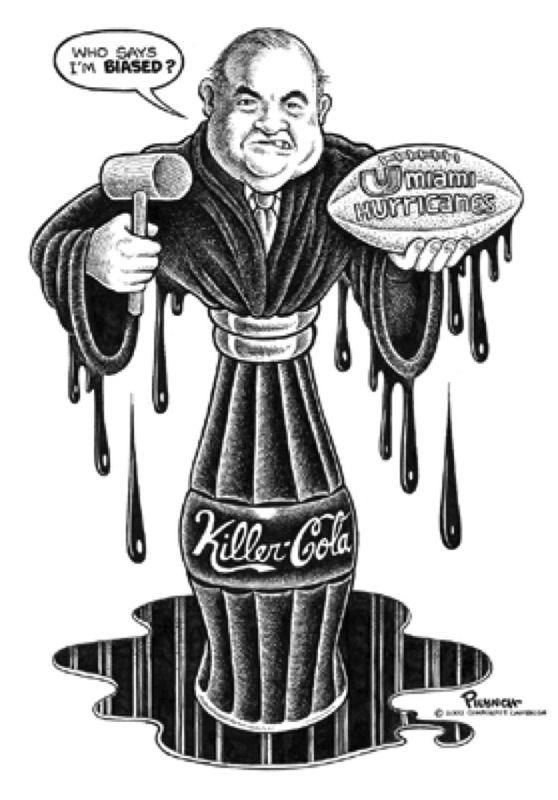 The Campaign to Stop Killer Coke believes Judge Martinez should be recused in light of his strong ties to the University of Miami and its athletics, which are intertwined with Coca-Cola. There are also questions regarding his work defending corporations in product liability matters. In addition, his former law firm has a relationship with a Colombian law firm in which a name partner was a vice president of Coca-Cola Colombia. See "Judicial Misconduct" in Lawsuits & Judicial Misconduct" section. In January 2004, New York City Councilmember and former police officer Hiram Monserrate led a delegation on a 10-day, fact-finding tour to Colombia to investigate allegations of human rights violations by Coca-Cola. "We heard one story after another of torture and injustice," said one member upon returning. "The sheer number of these testimonials was overwhelming." The delegation issued a scathing report in April 2004 that said: "Coca-Cola is complicit in human rights abuses of its workers in Colombia...The conclusion that Coca-Cola bears responsibility for the campaign of terror leveled at its workers is unavoidable." The report referred to "a total of 179 major human rights violations of Coca-Cola's workers, including nine murders. Family members of union activists have been abducted and tortured. Union members have been fired for attending union meetings. The company has pressured workers to resign their union membership and contractual rights, and fired workers who refused to do so...Most troubling to the delegation were the persistent allegations that paramilitary violence against workers was done with the knowledge of and likely under the direction of company managers...The delegation calls on the company to rectify the situation immediately, and calls on all people of conscience to join in putting pressure on the company to do so." See Monserrate report, WB11 news feature and "State of the Union:"
In an Oct. 29, 2004 report prepared for the Human Rights Committee of the American Anthropological Assn., entitled "Labor and Human Rights: The Real Thing in Colombia," American University Professor Lesley Gill wrote: "Eighty percent of the Coca-Cola work force is now composed of non-union, temporary workers, and wages for these individuals are only a quarter of those earned by their unionized counterparts. Coca-Cola has consistently pressured unionized workers to resign...Coca-Cola is in fact a stridently anti-union company, and the destruction of SINALTRAINAL, as well as the capacity to drive wages into the ground, is one of the primary goals of the extra-judicial violence directed against workers..."
"Murdered unionists are not the product of indiscriminate, chaotic violence . . . They are the victims of a calculated and selective strategy carried out by sectors of the state, allied paramilitaries, and some employers to weaken and eliminate trade unions. It is a strategy that emerges from, and is facilitated by, pervasive impunity." Based on interviews and discussions held in Bogota from July 3-17, 2005, Gill believes there is little evidence to suggest that The Coca-Cola Co. has substantially changed its business practices in Colombia. 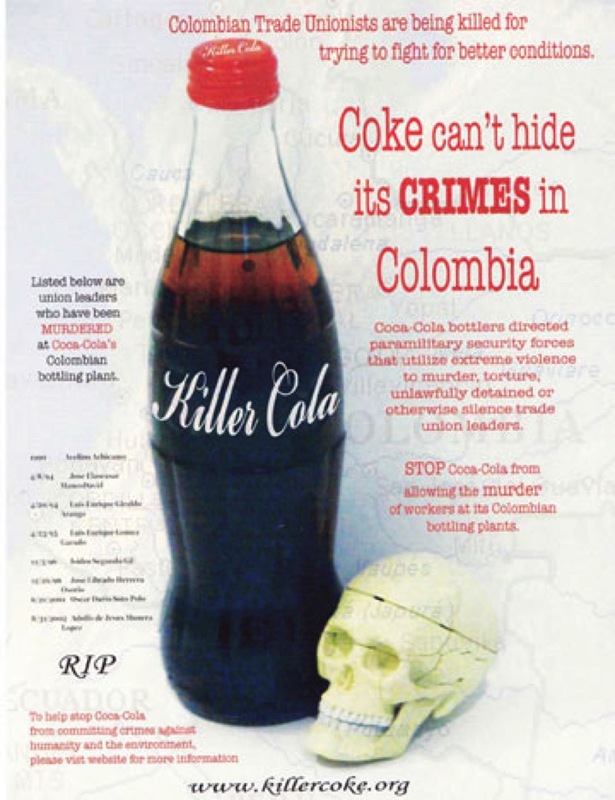 In July 2005, the London-based Colombia Solidarity Campaign published "The Anti-Coke Manifesto," a booklet by its secretary, Andy Higginbottom, a frequent visitor to Colombia. He reported that in 1993, SINALTRAINAL had 1,440 members working in Coke plants, but by 2004 that number had fallen to 389. Since at least the early 1990s, he says, Coke has used brutal methods to maximize return on its investments in Colombia and takes full advantage of the government's anti-labor policies. Former Coke CEO E. Neville Isdell boasted: "We have solid relationships with organized labor in Colombia." Responding to inquiries in April 2003, The Coca-Cola Company stated: "Coca-Cola bottlers have ongoing, normal relations with labor unions in Colombia and throughout Latin America . . . More than half the employees of our bottling partners in Latin America are unionized; in Colombia alone, almost 12,000 bottler employees are unionized." "The Coca-Cola Co. and our bottling partners have been valuable members of the Colombian community for more than 70 years and we respect the rights of all employees, including those who choose to be represented by labor unions...more than 30 percent of Coca-Cola system workers in Colombia are unionized, in a country where the average for all companies is about four percent...and employs approximately 8,000 people in Colombia..."
These claims are simply preposterous. Coca-Cola considers the vast majority of Coke workers in Colombia to be "flexible" workers employed through various subcontracting schemes, not employees. These workers have no chance of union representation, receive low pay and meager benefits (if any), have no job security and often are mired in poverty. Due to Coke's lobbying efforts in Colombia and the campaign of terror directed at union leaders, only about 4% of Coke's workers in Colombia belong to unions. Andy Higginbottom of England's Kingston University has written: "In Colombia, neoliberalism as an economic model — identified especially by the policies of privatisation, deregulation and the 'flexibilisation' of labor — was imposed from 1990 onwards." In that year new labour laws were passed that eliminated nearly every legal protection for permanent employment contracts, which encouraged subcontracting and temporary working. As a result, Higginbottom noted, "there are very few private industry trade unions left." Higginbottom estimated that in 1990, the Coca-Cola "system" in Colombia employed more than 12,000 workers, of whom 9,000 had permanent employment contracts. By 2001 there were only 2,500 direct employees, and by the beginning of 2005 less than 1,000 workers had stable employment contracts. The workforce employed...in Colombia is still nearly 10,000 workers, but 90% of these are now 'flexible' workers, employed indirectly through various forms of sub-contracting..."
Coke repeatedly and falsely claimed that the United Nations' International Labor Organization was going to do an "independent investigation" of the company's past and present labor practices in Colombia. However, that was a big lie that Coke perpetuated for years. The company's extensive personnel and financial links with the ILO and other UN agencies made such claims ridiculous, and the ILO itself, the IUF and Coke representatives contradicted Coke's assertion that the ILO was conducting such an investigation. This also becomes evident in the film 'The Coca-Cola Case' where an ILO representative makes it clear that no such investigation was being done in Colombia. Taking it to the streets at the 2010 Coca-Cola Shareholders Meeting. Colombia's largest union confederation, the United Workers Central (CUT), announced that the business sector of the United Nations International Labor Organization (ILO), led by The Coca-Cola Company's Director of Global Labor Relations Ed Potter, successfully maneuvered to keep Colombia off the list of 25 countries which the ILO will monitor in light of those countries' abuses of worker and labor union rights. While Colombia had been on this list for years given its continuing track record of anti-union violence, Potter led the business sector at the ILO's Tripartite Standards Commission (a commission made up of business, government and union groups and heavily-weighted toward business interests) in insisting that there be no such list at all if Colombia were included on this list. The CUT, which participated in this Commission, described the conduct of the business sector in this regard as "blackmail." Over the unions' objections, the list was finally approved with Colombia deleted from the list despite its continued position as the most dangerous country in the world for trade unionists. "Given The Coca-Cola Company's current bad publicity over its labor practices in Colombia - most recently documented in the film, 'The Coca-Cola Case' - it is clear that Potter wanted Colombia off the list as a means to quash the continuing controversy which Colombia's labor problems pose to The Coca-Cola Company," according to Ray Rogers, Director of the Campaign to Stop Killer Coke. However, Potter's machinations at the ILO have real-world consequences, for Colombia will use its deletion from the ILO "Most Wanted List" in its continued push to pass the Free Trade Agreements with the U.S., Canada and the E.U. - trade agreements which will benefit multi-national penetration of Colombia to the detriment of the rights of workers, the indigenous and Afro-Colombians as well as to the environment of Colombia. "Potter's and Coca-Cola's bullying tactics have been used before to maintain corporate control of the ILO," Rogers stated. Consider what happened at the ILO meeting in Geneva in June 2007: The Sydney (Australia) Morning Herald (6/6/07) reported: "Employers led by a Coca-Cola executive [Ed Potter] stopped the International Labour Organisation examining violations of workplace rights in Colombia..."
"Three years ago," Rogers added, "Potter worked to shield Colombia and Coca-Cola from any real scrutiny at a time when the Colombian government and multinational corporations were getting unwanted attention for their ties to paramilitary death squads that prey on workers and their unions." 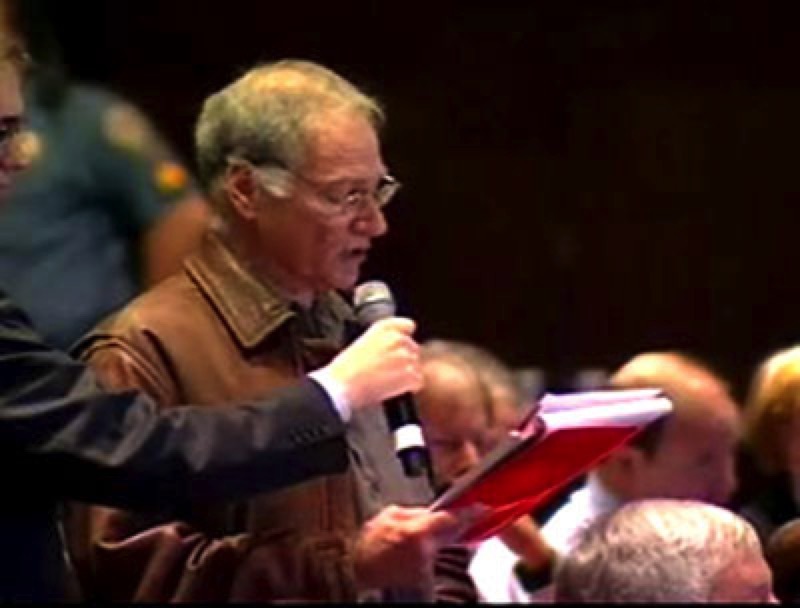 Lew Friedman questions Coca-Cola Chairman Muhtar Kent at the 2010 Annual Shareholders Meeting. Before I cast my vote for election of auditor, I want to know: Has there been an analysis of the long-term affects of outsourcing on System stability? We know about strikes in Ireland and South Africa with this as an issue. And it's an issue in the United States and Colombia. Is Coca-Cola going to continue in its efforts to bust unions by outsourcing, also referred to as sub-contracting, a scheme to turn employees into non-employees in Colombia? The vast majority of Coke workers in Colombia who wear Coke uniforms, drive Coke trucks, work in Coke plants and help make huge profits for Coke are subcontracted workers. These workers receive minimal pay, meager, if any, benefits, are fired if they try to join a union and have no job security. In April 2007, 16 Coke subcontracted workers were fired for joining SINALTRAINAL, the Colombian food workers union. This was a warning to all outsourced workers in the Coca-Cola System: You have no rights! Do not join a union! They state: "If we are robbed of $100 or $200, it comes out of our pocket; we have to pay for insurance; our uniforms; Coca-Cola rents us the truck--we have to pay for it every day; And also for any lost or broken bottles and crates;"
They were asked: "What does the company provide?" "Zip! Zilch! Nothing at all!...The worker is responsible for everything." "No. You can't join the union or you'll be fired. They don't want the union to grow." "How much did you make today and how many hours did you work?" "We started at 6 this morning until 9 pm. "How much did you make? " That's 15 dollars for 15 hours. Your efforts to be as union-free as possible and to undermine union organizing at your bottling facilities right here in the U.S. — in Georgia — were addressed in a book, "What Coca-Cola Did to Stop the Union from Coming In," by former Coke worker, Jeffrey Wright. Today, Teamster demonstrators outside are protesting Coke's efforts to prevent union organizing in the U.S.
Is the Board going to continue obvious company policy to outsource jobs, oppose unionizing and to prevent workers from bettering their working conditions? 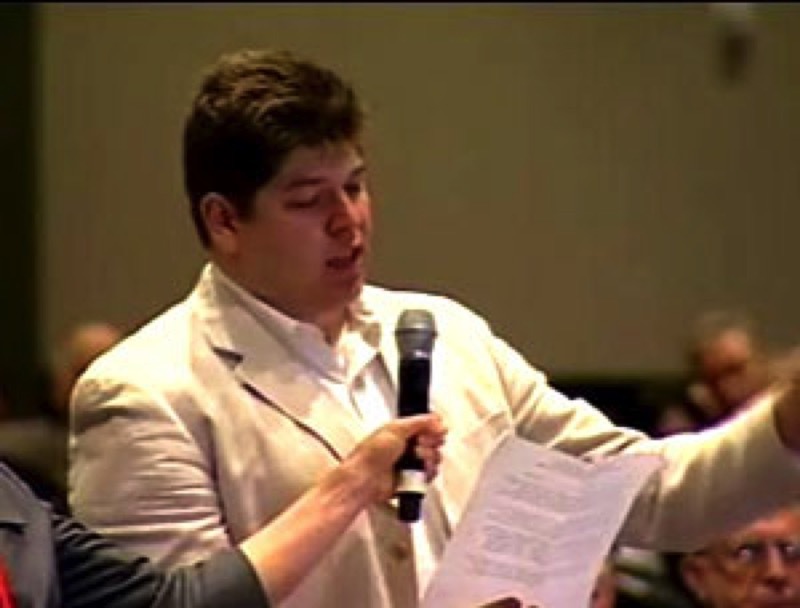 Ian Hoffman questions Coca-Cola Chairman Muhtar Kent at the 2010 Annual Shareholders Meeting. Before casting my vote for election of directors, I want to find out how board members plan to respond to statements made in "Belching Out the Devil: Global Adventures with Coca-Cola" by British author Mark Thomas, published last year. Chapter after chapter describes Coke's complicity in widespread criminal behavior and other misconduct relating to labor, human rights and environmental abuses. Information in this book is very troubling. 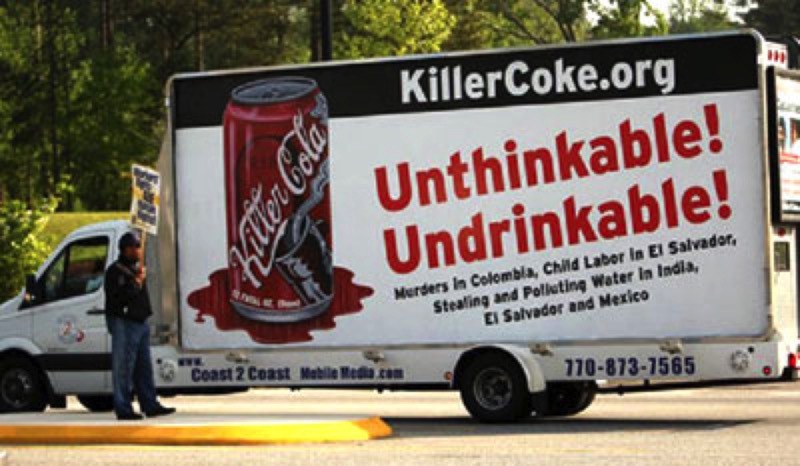 For example, is it true that Coca-Cola offered to pay at least eight figures, that is at least ten million dollars or more to end the Campaign to Stop Killer Coke and to settle the human rights abuse lawsuits claiming that Coke bottlers in Colombia are involved in the systematic intimidation, kidnapping, torture and murder of union leaders. At the same time according to Mark Thomas's book and the documentary, "The Coca-Cola Case" now playing to packed audiences around the world, Coca-Cola demanded that "anyone working for Coca-Cola FEMSA and involved in the lawsuits had to leave their jobs ... and would be legally bound never to criticize Coca-Cola ever again." This, according to the author, would mean the union SINALTRAINAL "would be finished and cease to exist in the Coca-Cola plants." If the information contained in the film and the book covering corruption and misuse of power by Coca-Cola on a grand scale is true, what is the board going to do? Executives past and present have turned a blind eye and refused to address these serious issues and the costs to the company are growing.